New data on carbon shows that China's emissions per head of population have surpassed the EU for the first time. The researchers say that India is also forecast to beat Europe's CO2 output in 2019. Scientists say that global totals are increasing fast and will likely exceed the limit for dangerous climate change within 30 years. The world has already used up two thirds of the warming gases researchers calculate will breach 2 degrees C.
The Global Carbon Project involves researchers from several different institutes around the world and it provides objective details on the scale of annual emissions. The latest data shows that a record 36 billion tonnes of carbon from all human sources were emitted in 2013. But in an interesting development, China's emissions per head of population exceeding those of the European Union for the first time. While the per capita average for the world as a whole is 5 tonnes of carbon dioxide, China is now producing 7.2 tonnes per person, to the EU's 6.8 tonnes. The US is still far ahead on 16.5 tonnes per person. "We now see China's per capita emissions surpassing the EU," said Dr Robbie Andrew, from the Centre for International Climate and Environmental Research in Norway, who was involved in the research. "They are still nowhere near the US or Australia, but the fact that they have surpassed the EU will be quite surprising to a lot of people." This development will shine an interesting light on global climate negotiations where China has often used its relatively low per capita emissions to argue that it is on the same page as other developing countries, and that restrictions on its use of carbon were not justified. China's rapid industrialisation over the past 20 years has seen the construction of huge numbers of mainly coal fired power stations. This build-up means that the emissions that China is committed to in the future, now exceed the total of everything it has emitted to date. Prof Corinne Le Quere from the University of East Anglia, who is also involved with Carbon Project, said that a significant proportion of China's emissions were in fact, driven by demand from consumers in Europe and the US. "In China about 20% of their emissions are for producing clothes, furniture even solar panels that are shipped to Europe and America." "If you look at the emissions in Europe with that perspective, they would be 30% higher if we accounted for those goods that are produced elsewhere." The other major emissions growth is seen in India. In 2013 the country's carbon grew by 5.1%, and it is now on track to overtake the EU in 2019. "India has enormous problems, if the current government could sort out the issues with toilets that would an enormous achievement," said Dr Andrew. "They have so many things to focus on in that country, to ask them to pull back on emissions, is a big problem." 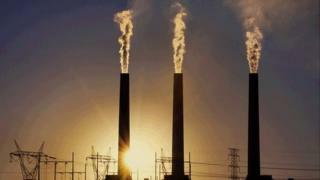 For 2014, the carbon record is likely to be broken again as emissions are likely to hit 40bn tonnes, 65% above 1990 levels. The researchers involved say the recent rise is due to the global economic recovery combined with a lower than expected increases in carbon intensity, especially in the developing world. The scientists have calculated that to have a good chance of keeping global warming below 2 degrees C, total emissions of carbon will have stay under 3,200 billion tonnes. The world has about 1,200 billion tonnes left, but the latest data shows that there is a now a declining chance of now staying below the 2 degree target. "The global emissions are continuing to increase at an incredible rate," said Prof Le Quere. "In about 30 years we will have used up the remaining quota, that's extremely rapidly, that's to have a 66% chance to remain below 2 degrees." The researchers say that existing reserves of oil, gas and coal exceed the 2 degrees target. Prof Le Quere says that this message has not been understood by politicians. "We have not accepted that we will not be able to burn all this fuel, the scale of action that is required has not sunk in." The new research comes as 125 heads of state and government are set to meet at the UN in New York to discuss climate change. UN Secretary General has asked global leaders to come to the UN next week and to bring commitments with them to tackle the issue. The meeting is meant to kick start the process to a new global deal that will be agreed in Paris at the end of 2015. According to the scientists, the politicians have a long way to go, if they are to prevent the world breaching the 2 degree target. "China and India are doing exactly the same as other countries," said Prof Le Quere. "I really think we need to show leadership in the way we use energy in rich countries so that others can follow different pathways to development. At the moment we don't see any countries that have that leadership." Details of the studies dealing with the Global Carbon Project have been published in the journals, Nature Climate change, and Nature Geoscience.